Welcome to the second week of “Small Things that Make us Happy” . This week we wanted to share with you what has been, from our point of view, the best accessories buy for our baby, in terms of good value for money. And without further ado… The Baby Musical Mobile. We are a family that lives within a budget so for us buying a whole nursery for our baby was completely out of range, but it’s ok, it requires more creativity from our part and a bit more of a search for a good bargain. At the end, we can provide our baby with everything he needs or, better said, with everything we want for him. Having said this, we were looking for a cot mobile. We looked it up in sites like ebay or amazon cause we usually find good deals in there, but the cheapest one we found was around £25. That is something we weren’t gonna spend since it’s not a real need, but rather just an entertainment for him to help him calm down when going to sleep. We kept searching: mothercare, toysrus, all of these places and nothing. Until one day we were doing some shopping at Quality Save and found this cute baby mobile, for just…WAIT FOR IT… 5 POUNDS!!! Yep. We thought maybe it was just a part of it and we needed to buy something else, but nop, it had the whole thing! 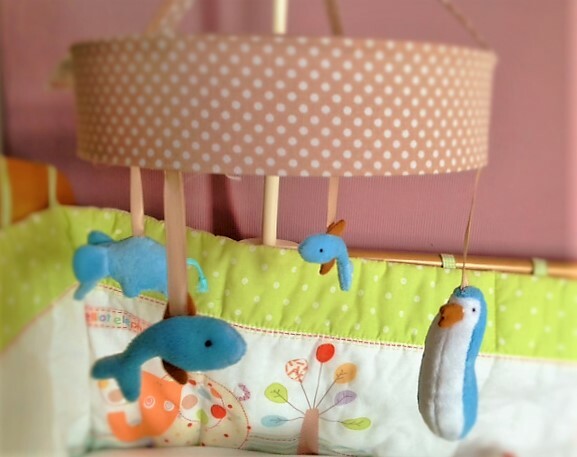 Little cute animals, music, and an easy and secure way to attach it to the cot. Do other baby mobiles look cuter, fancier and do more stuff than this one?? Maybe…BUT, this made us so happy! It’s been one of those purchases that you get amazed of its quality and price. Our little E loves it, we love it! and our pocket LOVES it too!